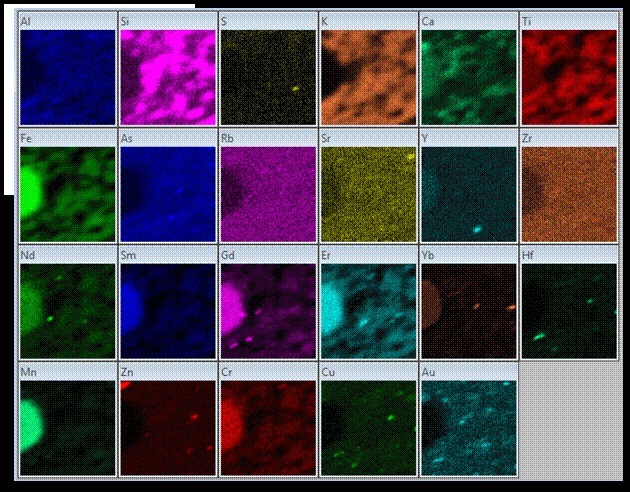 Figure 1: Element maps of mica schist with garnet using IXRF X-beam mounted on a JEOL JSM-6460LV. Dwell time was 5 s per pixel. Maps cover 2 by 2mm with 100 by 100 pixels. Recent advances in poly-capillary fiber optics permit the focusing of X-ray beams onto samples with beam diameters as small as tens of micrometers (Cross and Witherspoon, 2006). The usefulness of this accomplishment is realized when these small X-ray beams are coupled with an automated micrometer-resolution stage, such as commonly found on scanning electron microscopes (SEM). An added bonus is that most SEMs have energy dispersive X-ray spectrometers (EDS) attached to them. Photonic excitation of samples produces X-ray characteristic of the elements within the sample similar to electronic excitation, however with less background because atomic particle interactions do not take place (ref). The benefit of this is that the EDS system can detect the characteristic X-rays generated by the sample with a much lower background than that produced by electron beam excitation for energies greater than 2 keV. Additionally, Micro XRF used in conjunction with a SEM, better geometries and high vacuum environment (SEM) offer advantages relative to standard “benchtop” Micro XRF for a fraction of costs. 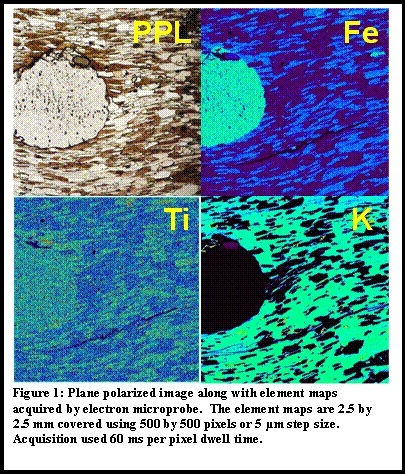 Using an IXRF Systems X-beam with a nominally focused 40 µm beam diameter, a portion of approximately 1.9 Ga mica schist from the Black Hills of South Dakota was mapped (Fig. 1). The schist is a metamorphosed ash tuff with a relatively homogeneous bulk composition that exists over a large area of the Black Hills (Schwandt et al. 1996). The schist is transected by two isograds and contains garnets from each of the three major metamorphic zones represented in the schist. Schwandt et al. (1994) attempted to understand the partitioning behavior of trace elements in metamorphic systems by examining the distribution and signatures of trace elements in garnets of this mica schist using secondary ion mass spectrometry (SIMS). The abundance levels of the trace elements, particularly the rare earth elements (REE), were low enough to require SIMS (Table 1). The abundance levels of the REE in the matrix minerals muscovite, biotite, feldspar and quartz are typically lower than in garnet and not previously detectable in rock sections using electron probe microanalysis. Schwandt et al. (1996) measured the concentrations of trace elements in bulk rock samples by instrumental neutron activation analysis. However, accessory minerals like zircon, xenotime, and monazite incorporate much larger amounts of the trace elements into their crystal structures than the crystal structures of the matrix minerals. Therefore, understanding the partitioning and distribution of trace elements that occurred during metamorphism or metasomatism was understandably incomplete; that is, until now. The analytical potential of the X-beam are revealed by elemental mapping of samples (Fig. 1). Quantification of the data can be accomplished as standards are found or fabricated, so that calibration curves can be developed for the X-beam system. Figure 2: Plane polarized image along with element maps acquired by electron microprobe. The element maps are 2.5 by 2.5mm covered using 500 by 500 pixels or 5 µm step size. Acquisition used 60 ms per pixel dwell time. Figure 2 shows a plane polarized light optical image and major element maps acquired by electron microprobe stage mapping. This is the same garnet in the schist matrix for comparison with the numerous trace elements as acquired using an X-beam with a nominally 40 micrometer focused spot diameter (Fig. 1). With the IXRF software, the sum spectrum can be viewed which clearly demonstrates reasonable peak to background ratios. Of course, the spectra for individual pixels can be more extraordinary given that the sum peak is similar to an average. Examining Figure 1, there are obvious locations where individual elements have very high concentrations. These locations have correspondingly higher peak to background ratios than looking at the sum peak (Fig. 3) would suggest. Importantly, the fact that different elements are concentrated in different locations argues against their being artifacts. The maps are exceptional when one realizes the concentration of several of the trace elements in the mica schist occur only at concentrations of parts per million within the garnet (Table 1) and therefore must be much lower in the matrix minerals. Importantly, the fact that different elements are concentrated in different locations argues against their being artifacts. The maps are exceptional when one realizes the concentration of several of the trace elements in the mica schist occur only at concentrations of parts per million within the garnet (Table 1) and therefore must be much lower in the matrix minerals. This is only a start; however, the technique shows much promise for geological applications. The implications of this work suggest the technique could prove valuable for a number of industrial applications as well. 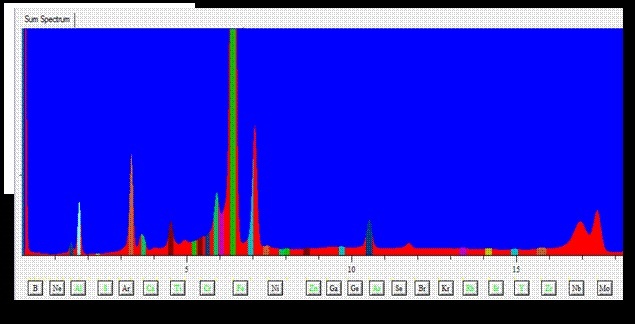 Figure 3: The sum spectrum of the XRF maps shown in Figure 1. Cross, B.J., and Witherspoon, K.C. (2006) Advancing EDS Analysis in the SEM with in-situ Quantitative XRF. Proceedings of the International Micrsocopy Congress 16, Sapporo, Japan. Schwandt, C.S. (1991) Intra- and Intercrystalline Behavior of Trace Elements During Metamorphism: A SIMS Study of Garnets, Dissertation, South Dakota School of Mines, Rapid City, South Dakota. Schwandt, C.S., Papike, J.J., and Shearer, C.K. (1996) Trace-element zoned garnets from a pelitic schist: Black Hills, South Dakota. American Mineralogist, 81, 1195-1207.